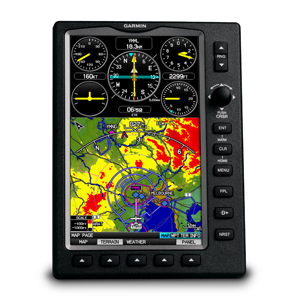 With the addition of IFR map mode, Garmin FliteCharts® and ChartView™, the GPSMAP 695 provides key functions of a Class 1/Class 2 electronic flight bag (EFB), reducing the use of paper charts in the cockpit. When in IFR map mode, the 695 can display victor airways, jet routes, minimum enroute altitudes and leg distance, much like what’s found on traditional enroute charts. With FliteCharts, you can quickly find and view all U.S. AeroNav Services, standard terminal arrival routes (STARs), approach charts and airport diagrams. A geo-referenced version of FliteCharts will be available in late 2010, which will provide you with an on-screen representation of your aircraft’s exact position overlaid directly onto these charts. For pilots who prefer Jeppesen charts and diagrams, Garmin also offers ChartView. The ChartView service utilizes Jeppesen’s extensive library to provide global geo-referenced charting capabilities (Chartview activation instructions). The GPSMAP 695 features a high-resolution terrain page showing hazards relative to your altitude and a vertical profile of terrain along your route of flight. It comes with a built-in Jeppesen database, and an Americas, Atlantic or Pacific terrain database. It also includes an obstacles database for the U.S. or Europe. Using this information, the 695 displays your flight route over contour terrain mapping. With information from the terrain and obstacles databases, the 695 monitors your current position in relation to surrounding terrain to provide alerts. To help keep pilots aware of special airspace activity, over 683 parachute drop zones are detailed in the Americas navigation database. You can even customize your own minimum clearance levels to receive terrain cautions. The 695 also comes with a realistic “view from space” satellite imagery basemap. To gain quick familiarity with all the features and operation of your GPSMAP 695, Garmin offers a fully interactive, computer-based training program. It’s called the eLearning Program, and it’s a self-paced, Windows® compatible application developed in conjunction with Pegasus Interactive to help new users take advantage of all the capabilities their GPS unit offers. The software is available in lifetime or lower-cost subscription licenses and is available from authorized Garmin dealers or directly from flyGarmin.com. The eLearning program for your GPSMAP 695 lets you select specific topics of interest, and then learn by doing. A scenario-based guided simulation system helps you practice the selected task or process by following step-by-step, on-screen prompts. You’ll see a simulated multi-media demonstration; then repeat what you’ve learned, hands-on, to reinforce and assess your skills. Getting started with Garmin eLearning is the fast, fun way to master your new portable GPS.